Much branched woody shrub or small tree with alternate, ovate-heart-shaped leaves, somewhat hairy, and large, axillary, orange-yellow flowers. To 1.5m. [Beadle, Don]. ‘This [Sida mollis] is really a very desirable plant for the stove. Its leaves are large, handsome, and its flowers when the plant is well grown, are two inches across, of a fine clear orange-yellow, and produced in considerable abundance. It is a native of Peru. Seeds were received at the Glasgow Botanic Garden from Gottingen, under the name S. grandifolia; and as such, it is published in Willdenow’s Enumeratio, and figured in the Botanical Register.’ [BM t.2759/1827]. Introduced to Britain in 1816, and raised at the Glasgow Botanic Garden under the name Sida grandiflora. [Don]. BR f.360/1819. Listed only in the 1857 catalogue [T.926/1857]. Naturalised at Camden Park, quickly colonising fallow ground in the gardens. Found on waste ground around Sydney. [Beadle]. Sida mollis Rich. (1792) = Sida glomerata Cav. Sida mollis Herb.Banks ex Griseb. 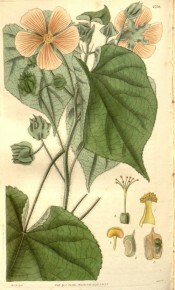 (1859) = Sida cordifolia L.